Using LUMISmile, your LUMINEERS dentist will show you an eye-opening before-and-after comparison of how incredible your smile can be with LUMINEERS. It’s free, takes only 30 minutes, and you see your results in the same visit. 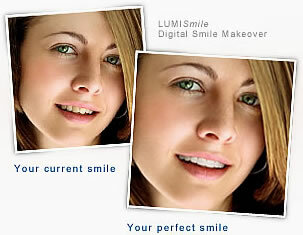 LUMISmile is only available from a LUMINEERS dentist, so call 888-437-7179 to find a LUMINEERS dentist.